Download it now and use it forever! This is an Instant Downloadable E-Book. If you are unsatisfied with the book for any reason, we will refund your money. 60 day money back guarantee. Glean journaling inspiration from renowned author and journaling expert Joanna Campbell Slan. 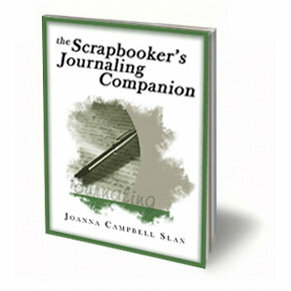 The Scrapbooker's Journaling Companion is a Scrapbook.com exclusive packed with hundreds of journaling helps. Have you been tempted to spend hours creating beautiful layouts and then wimp out on your journaling? The hope is that this little handbook will be your steadfast companion helping you find just the right words to accompany your priceless memories. The Scrapbooker's Journaling Companion contains over 70 pages with hundreds of ideas to inspire your journaling including Overcoming writer's block Dealing with your reluctance to journaland Making your writing meaningful This e-book also provides helpful ways for anyone to conquer common journaling stumbling blocks: Missing dates Lost memories People you'd rather forget Disappointments Losses Unattractive handwriting Journaling without photos and MORE! You'll also love the Journaling Worksheets with hundreds of journaling starts: Journaling my family's heritage Journaling about yourself (Great for Book of Me ideas!) Journaling about my scrapbooking My life as a parent Journaling aboutà my baby, my preschool child, my pet, my pre-teen and MORE compiled just for scrapbookers. You won't believe how The Scrapbooker's Journaling companion will make your pages sing with your melodious memories!. Remember, too, this e-book carries our money-back guarantee. Order it, download it, use it, And if you don't like it, tell us within 60 days that you've deleted it from your computer and haven't printed any copies (or have destroyed the copy you made), and we'll refund your money, no questions asked. Keep the inspiration you've received as a gift of appreciation for trying the book. Step 1: Order "The Scrapbooker's Journaling Companion" from Joanna Slan and Scrapbook.com. Step 2: Click on the button after checkout and your E-Book is INSTANTLY delivered to your computer. Step 3: Save " The Scrapbooker's Journaling Companion" to your hard drive and/or print it out. Step 4: Let the creativity and inspiration flow! If you have any questions or problems you can e-mail us at store@scrapbook.com You must use the latest version of Adobe Acrobat Reader to view or print this file once purchased. If you do not have Adobe Acrobat on your computer, go to www.adobe.com to download a free copy. Get your copy of The Scrapbooker's Journaling Companion today. It's 100% Risk Free.